Cavo Greko Outstanding traditional climbing location in atmospheric coastal setting. Around 180 recorded traditional routes, M to E6. Pyla Sea cliff with around 18 trad routes, VD to E6. Pendadhaktylos Oustanding sport and trad cliffs just beyond Nicosia, in the north. Many sectors in various different aspects. Continues to be developed by a small band of enthusiasts. Agios Irakleidhios This sector has access issues - climbing is only allowed on the first Saturday and Sunday of each month. Germasogeia Undeveloped grit-like cliffs overlooking Germasogeia reservoir, near Limassol. Happy Valley Decent little trad climbing area near Limassol. Over 20 routes, in low to mid grades. Troodos Two sectors on slighly iffy rock in pretty surroundings. Dhiarizos Superb limstone sector containing over 50 well bolted sports routes in range 4 to 7c+. Episkopi/Pafos Fantastic undeveloped limestone crag. Potential for dozens of super-hard sport routes, but in a protected area. Discussions are currently underway to get permission for limited routes. Droushia/Ineia Most extensive and varied climbing on the island. 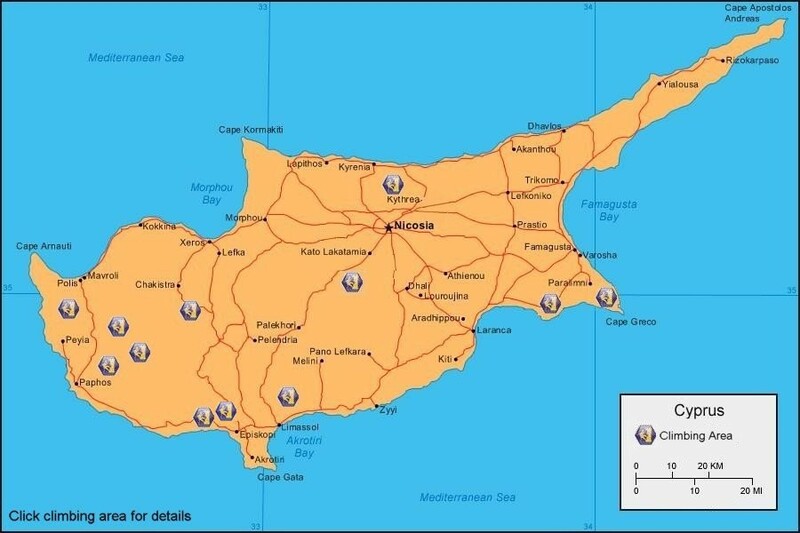 Eight developed crags, sports and trad, close to Polis and within 30 minutes of Pafos. Xeros Valley Great sector in a peaceful and remote location above the Xeros river valley. Episkopi/Limassol New sector about 10km west of Limassol.